Salesperson of new Kawasaki Yamaha Can Am Sea Doo BMW SSR Benelli motorcycles, ATV, UTV, and PWC. This dealership is one of the top dealers for YAMAHA Waverunners in the Southeast, we sell a bunch of Seadoos and jetskis also. Now would be s perfect time to join our sales team before the season opens up. We are located in Louisville Tn. a suburb of Knoxville Tn. We are 20 minutes from the smoky Mountains and have 5 lakes in our area. 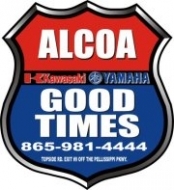 See our two websites www.AlcoaGoodTimes.com and www.BMWMotorcyclesofAlcoa.com. We are the new BMW dealer! We are full line Canam,Yamaha, Kawasaki dealership, plus we sell Kymcos. We sell Suzuki and Honda atv/motorcycles used. We have a huge showroom for new and used units, an extensive Parts Department along with a complete Service Department. We are very active on the internet for unit sales, parts and accessories. We are conviently located near Knoxville, Maryville & Alcoa. Our customers are number one and we strive to have complete customer satisfaction. We are closed Sundays and Mondays.